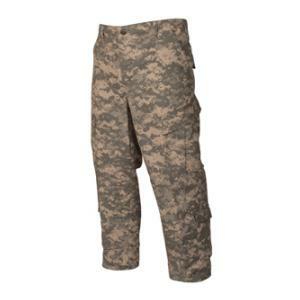 This BDU pant is made of 100% cotton Rip-Stop Vat Dyed material. It has an 8 pocket design, 2 front slash pockets, 2 slanted, bellowed cargo pockets with hook & loop flaps, 2 adjustable waist tabs which are secured with 4 bartacks, reinforced knee patch pockets with hook & loop opening for knee pads, button fly closure, and drawstring leg ties. US materials sewn overseas. These pants are not military issue.